When warmer weather hits, more and more people take their bicycles out on the roads. You could be on your way to work, on your way to school, running some errands, or maybe just going for a ride—regardless, in the eyes of Washington State law, a bicyclist has equivalent road rights to motor vehicle drivers. 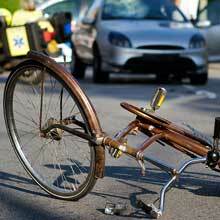 But cyclists are clearly more vulnerable to injury. Because your rights are the same, you must abide by the same traffic laws. Keep this in mind when riding on roadways—especially in high-traffic areas.